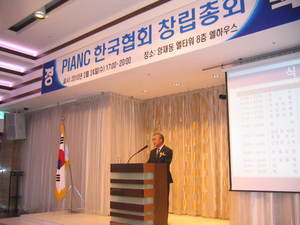 Mr. Kawashima, president of PIANC-Japan, has been invited to a foundation ceremony meeting of Korean section of PIANC on 24th Feb. 2010 and delivered an address. The meeting has taken place at a meeting room in Seoul from 17:00 to 20:00. PIANC-Japan has supported Korean section for its preparation of foundation by providing information about our organization. An agenda of the meeting includes declaration of the meeting, election of a president of PIANC Korean section, report of progress of the foundation and business plan, a special lecture by the president of PIANC-Japan, Mr. Kawashima, and a banquet. An attached picture is taken on the occasion of the special lecture given by Mr. kawashima.